Music sleuths have some new tools waiting in the App Store. On Friday, Shazam Entertainment released a major 3.0 upgrade to the free and paid versions of its music discovery app for iPhone and iPod touch. Shazam and Shazam Encore 3.0 offer more access to media—more related YouTube videos for each song you tag, more artist information, plus new features like album reviews, biographies, and the ability to search for iTunes ringtones and videos. A new Discover tab now provides access to Shazam Tag Charts, which track the most popular new music from 20 countries, based on what Shazam users in those countries are tagging. 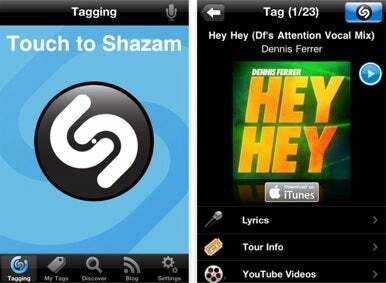 Shazam’s apps are now optimized for both iOS 4 and the iPhone 4, so they support fast-app switching and feature high-resolution graphics. Shazam and Shazam Encore are available now in the App Store for free and $5, respectively. The free version is still limited to five tags a month, while the paid Encore version offers unlimited music tagging. The special edition (Shazam) Red app will gain all these enhancements in its own upgrade soon.